This is the invitation I received on May 25, 2005. I hope you don't find it too hard to read. posted by Denyse @ 3:34 p.m. 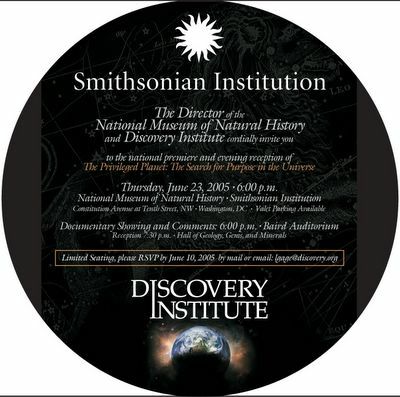 In “Smithsonian to Screen a Movie That Makes a Case Against Evolution”, New York Times reporter John Schwartz tries to cover—at very short notice—the growing uproar first blogged here about the Smithsonian letting an ID-friendly film be screened. Schwartz gets a lot of stuff right. 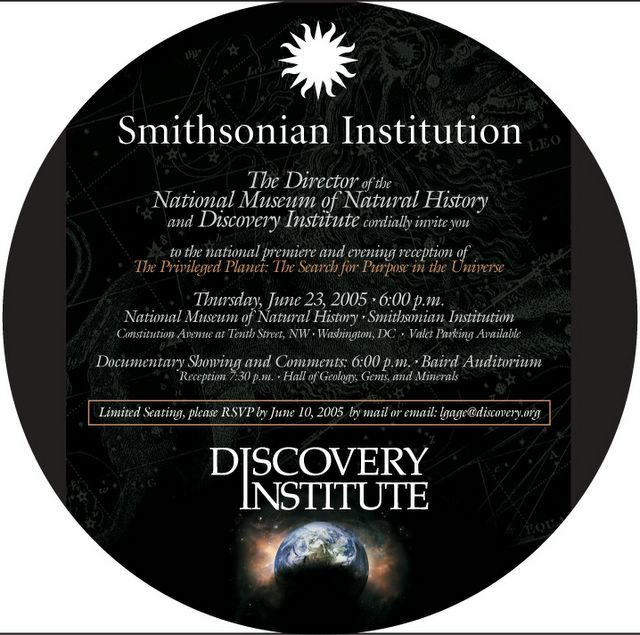 He notes, for example, that the Smithsonian is not available for “events of a religious or partisan political nature”, which means that when the staff viewed Privileged Planet, they did not interpret it that way. Nor did I. You would only interpret it that way if you assumed that science is the publicly funded Church of Carl Sagan and Richard Dawkins, and that therefore evidence of actual design in nature or the universe must be suppressed. 1. He seems to think that the ID-friendly film Privileged Planet opposes evolution. It doesn’t, actually; it opposes Darwinism and naturalism—the idea that evolution could happen without any guidance at all. Most Americans do not in fact believe in Darwinism or naturalism, so it shouldn’t really be any surprise that some people produce films that do a pretty good job of making the opposite case from the science evidence. The film doesn't touch on Darwinian evolution. It looks at the many factors that contribute to a habitable planet and to our ability to discover things about the world, from our position in the galaxy to the fine-tuning of the physical constants. Some of the scholars interviewed make a case against materialism and for the design of things like the fine-tuning of the physical constants, but the film also gives the opposite view an airing, namely that it was just luck. But neither the film nor any of the scholars interviewed take a position on, or even mention, the issue of how life might have arisen or diversified once those conditions were in place. From Denyse: Thanks to screenwriter Witt for the clarification! I hadn’t actually noticed anything in the film about the origin of life or Darwinian evolution, but—let’s face it—if Carl Sagan (whose views are addressed in the film) was wrong, so is Richard Dawkins. It simply cannot be the case that the universe shows abundant evidence of intelligent design but life forms do not. 2. He identifies me as an “ID proponent”. As I said in By Design or by Chance?, I am a post-Darwinist. I think Darwin was wrong on key points but that does not make ID right. Mr. Kremer said he heard about the event only on Thursday. He added that staff members viewed the film before approving the event to make sure that it complied with the museum's policy, which states that "events of a religious or partisan political nature" are not permitted, along with personal events such as weddings, or fund-raisers, raffles and cash bars. It also states that "all events at the National Museum of Natural History are co-sponsored by the museum." If you want to know what the anti-ID people think of all this, go to Panda’s Thumb. Incidentally, the Thumbsmen think that scientist Richard Sternberg was the insider who offered me a political take on the situation, but he wasn’t. He only told me he would attend the event. It’s interesting that not one of the Thumbsmen thought of writing me to ask. As if I would trust a scientist for a political take! Well, no, Brucie baby, they didn’t say that, but they would not have taken your money if they were not going to co-sponsor an ID-friendly event. And that—in my experience covering this controversy—is a “stunning” change. Hey, buy yourself a drink. Better yet, buy that PR agency a drink. By the way, those of you who like this blog, buy my book on the intelligent design controversy and keep me in business. Go to By Design or by Chance? posted by Denyse @ 12:42 p.m.